God does not do for you what you have the power to do for yourself. Please understand that not all of these links may be worthy of belief and that it is important to trust in the Pope as teacher and not necessarily items in these links. The Mystical City of God; is the collected revelations made by the Blessed Virgin Mary to the Venerable Mary of Jesus of Agreda (a 17th Century nun). This book has been acclaimed by Popes, cardinals, theologians, as well as the clergy and the laity for over 300 years. The Mystical City of God has been published in sixty editions in various languages. The translator, Father George J. Blatter, a Chicago priest, first read the book in German and was so impressed that he learned the Spanish language in order to make a proper translation into English. His first edition appeared in 1912, ten years after he started his work. The Holy House, U.S.A., located at the Blue Army Shrine, has a chapel within it that is a replica of the original Holy House of Nazareth where Jesus, Mary and Joseph lived. It has the same dimensions (13 X 36 feet). The Holy House Chapel has a reliquary with special relics and treasures. Also included are a statue of Our Lady of Loreto and a wood carving of St. Joseph as he appeared at Fatima on October 13, 1917. 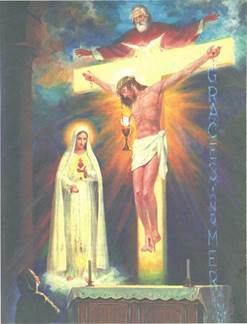 Sister Lucia's vision of the Holy Trinity ("the Last vision of Fatima" at Tuy Spain) is depicted in statuary in the Holy House U.S.A. Chapel. Feel free to download, copy, update, change, and modify these presentations. First, it is well to remark two things: the first is that love ought to be put more in deeds than in words. Saint Luke the Evangelist Church, Raleigh NC - Adoration and Our Lady of Guadeloupe's picture from the Pope in the old chapel.